Sometimes alliteration (consecutive words that all start with the same sound) can be helpful. Other times, it makes it harder to remember what you’re studying. What about when it comes to solute, solvent, and solution? This is one of those times that alliteration makes things harder. Let’s get each definition straight, once and for all! My way of visually remembering may not be pretty (okay, my art “skills” make it downright ugly!! ), but it’s simple and easy to remember. If you don’t feel like watching my ugly drawing in the video, skip down a bit to read the written explanation (with examples). Solute refers to the particles that are being dissolved. (Here’s the official definition for solute…but it’s pretty much the same as mine.) I also like to call them the “stuff”. It’s not exactly medical jargon, but it helps me remember! Basically, any particle that can be dissolved has the potential to become a solute. For example, if you have NaCl (otherwise known as table salt), it is not a solute when it is still sitting on your table in the salt shaker. But when you sprinkle some salt into hot water and it dissolves so that you can’t see it anymore, it has become a solute. Solutes are also important in the body. Any particle that can dissolve in the body’s water is considered a solute. This includes all of the electrolytes (i.e sodium, potassium, etc), as well as other particles such as albumin, glucose, and even blood gases like oxygen and carbon dioxide. Almost all IV fluids that we administer contain at least one solute. The most common solute is NaCl, which is what is found in normal saline. Dextrose is also added as a solute when we want to provide the patient with extra calories. Lactated Ringers has a well-rounded assortment of solutes in the form of electrolytes. Since blood cells do NOT dissolve (they just float around in the plasma), they are NOT a solute. A solvent is any liquid “having the power of dissolving“. But I prefer to think of it this way: any liquid having the SUPERpower of being able to dissolve stuff ? Because isn’t it actually a superpower when a liquid can literally make things disappear? Maybe not…but it’s still pretty cool. When you think about electrolytes dissolving in your blood, do you realize that those particles are usually dissolving in water? It’s true! Plasma (the liquid part of our blood) is made up of approximately 90% water. 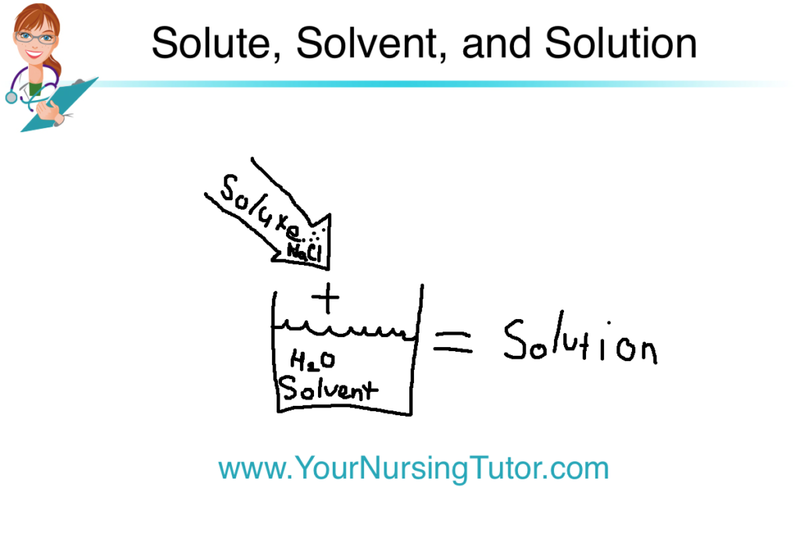 That’s why the most common example of a solvent is water. Water is sometimes called the “universal solvent” because it is so good at dissolving a large variety of solutes. Just about any liquid can be a solvent, however, as long as there is a solute that can be dissolved by it. 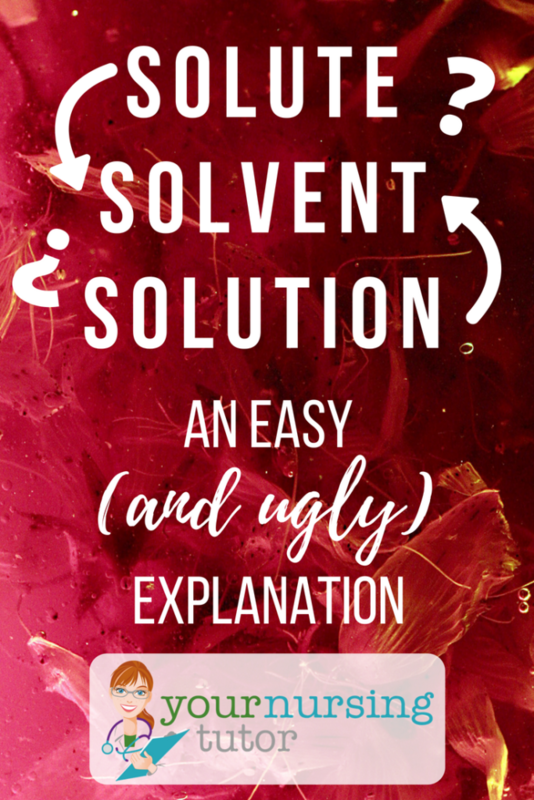 Actually, solvents aren’t limited to only liquids…they could also be a gas! But for the purposes of nursing school, you’re only going to have to worry about liquid solvents. A solution is the combination of the solute (aka particles or “stuff) and the solvent (aka liquid). Once the solute dissolves into the solvent, you have a solution. It’s the final product. And solutions are a very handy thing to have around. It would probably be easier to tell you what ISN’T a solution. In fact, you’ve been making and using solutions all your life, and may not have even known it! Whenever you add sugar to your coffee, you’ve created a solution. Ditto for lemonade, FYI ? Every commonly used IV fluid is a solution: Normal Saline, 3% Saline, and 0.45% Saline are all good examples. And you may have already guessed this, but blood (or more specifically, plasma) is also a solution. Once you dissolve the electrolytes, albumin, glucose, and other solutes into the water solvent of the human body, the result is a solution. What happens to solute after it enters the solvent? After the solute enters the solution it begins to both dissolve AND diffuse. Diffusion happens when the solute particles spread in the solvent so that they’re evenly distributed in the solution. You can read more about it (and watch an interesting video experiment) at that link. 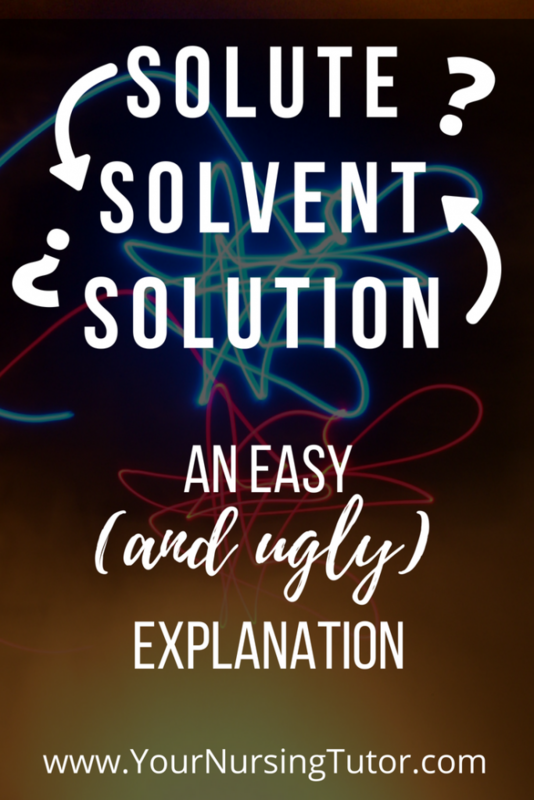 So, will my bad artwork help you remember the definitions of Solute, Solvent, and Solution? Leave a comment below and let me know! Wow. Thank you. Much easier to understand ? hey thanks a heap for that! that was the only thing that i was confused about, but now that is all cleared up i think im ready for my test tomorrow! 🙂 thanks. Aspiring R.D. here. You explain things so well! Thanks! Mrs. Nicole just wanted you to know that your video is very helpful and enjoyable as my Instructor stated in her voice over. I really, really enjoyed: Please keep me posted as you update or post you videos. University of Mary Hardin-Baylor, Pr-Nursing Student. Use what works for you. You know how your brain works best.